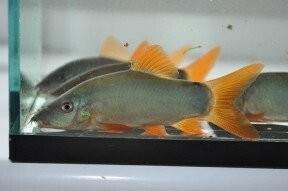 ...and this is the yellow-finned one with blue dorsal which may represent a different species. This species was described from the town of Phra Nakhon Si Ayutthaya, Ayutthaya province, central Thailand, located at the confluence of the Chao Phraya, Lopburi, and Pa Sak rivers. It’s since been collected throughout much of the middle and lower Mekong basins in Thailand, Laos, Cambodia, and Vietnam plus the Chao Phraya and Mae Klong drainages in western and central Thailand. In the Mekong several populations are known to exist which may overlap slightly during the spawning season, and especially in the upper part of the system. 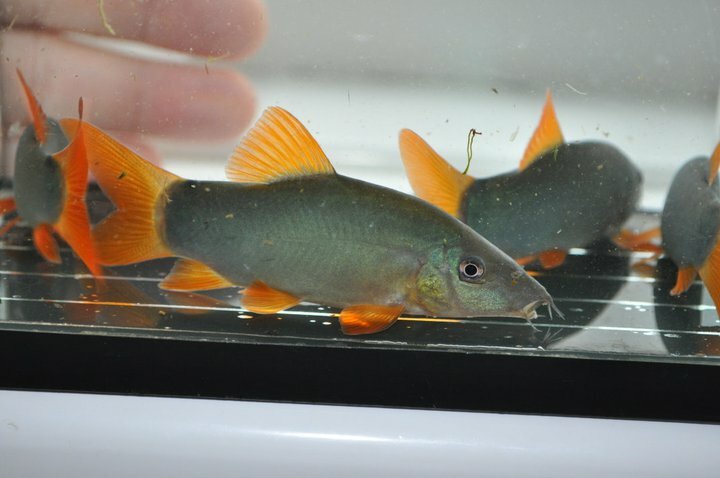 Of the wild fish collected for the aquarium trade, many are thought to originate from the Songkhram River, a Mekong tributary in northeastern Thailand. This species is apparently quite common across its native range and according to Rainboth (1996) shows a preference for flowing waters where it takes refuge among submerged rocks, tree roots, etc., during daylight hours, emerging to forage under cover of darkness. It undergoes seasonal migrations as part of its life cycle (see ‘Reproduction’) and can thus be found in various habitat-types depending on the time of year from main river channels to smaller tributary drainages and temporarily-flooded zones. It co-occurs with Yasuhikotakia lecontei, Y. morleti, and Syncrossus helodes across much of its range and in a survey of the Mun River conducted in Surin province, northeastern Thailand was collected alongside a host of other fish species including those three plus Acantopsis choirhynchos, Lepidocephalichthys hasselti, Barbonymus altus, B. gonionotus, Cyclocheilichthys apogon, C. repasson, Discherodontus ashmeadi, Epalzeorhynchos frenatum, Esomus metallicus, Hampala dispar, H. macrolepidota , Mystacoleucus marginatus, Barilius koratensis, Osteochilus hasseltii, Raiamas guttatus, Rasbora borapetensis, R. dusonensis, R. rubrodorsalis, R. trilineata, Puntius orphoides, ‘Puntius‘ partipentazona, Gyrinocheilus aymonieri, Trichopodus pectoralis, T. trichopterus, Trichopsis pumila, T. vittata, Pseudomystus siamensis, Mystus singaringan, Kryptopterus cryptopterus, and Mastacembelus favus. For long-term maintenance an aquarium with base measurements of 150 ∗ 45 cm or equivalent should be the smallest considered. Otherwise be sure to provide plenty of cover as Yasuhikotakia spp. are inquisitive and seems to enjoy exploring their surroundings. Rocks, wood, flower pots and aquarium ornaments can be used in whichever combination to achieve the desired effect. While Yasuhikotakia spp. appear to be chiefly carnivorous they will also eat vegetative matter if available, often including soft-leaved aquatic plants. The natural diet comprises aquatic molluscs, insects, worms, and other invertebrates. Milder in temperament than some congeners such as Y. eos and Y. morleti but prone to occasional phases of aggression and may nip trailing finnage. Slow-moving or long-finned fishes are best omitted with active, pelagic cyprinids such as many Devario, Rasbora, Barilius, ‘Puntius‘, and some Danio spp. representing more suitable tankmates. In terms of other bottom-dwellers it should coexist relatively peacefully with most Botia and Syncrossus spp. or in very large tanks, Chromobotia macracanthus. Some cobitid and nemacheilid loaches are also possibilities as are members of Epalzeorhynchos, Crossocheilus, Garra, and many catfishes. As always, thorough research prior to selecting a community of fishes is the best way to avoid potential problems. Yasuhikotakia spp. are gregarious, form complex social hierarchies and should be maintained in groups of at least 5 or 6 specimens, preferably 10 or more. When kept singly they can become withdrawn or even aggressive towards similarly-shaped fishes, and if only a pair or trio are purchased the dominant individual can stress the other(s) to the extent that they stop feeding. Sexually mature females are normally fuller-bodied and grow a little larger than males. 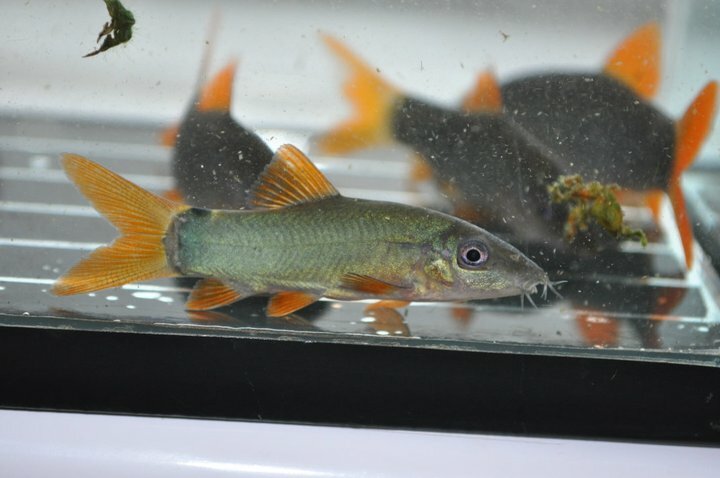 Some Yasuhikotakia species, including Y. modesta, are farmed commercially for the hobby via the use of hormones but reports of breeding by private aquarists are unheard of, possible because the majority are seasonal, migratory spawners in the wild. For example, in the lower Mekong basin Y. modesta undergoes an upstream migration, apparently triggered by receding water levels, between November and March each year whereas from May to July it migrates in the opposite direction as waters rise once more. It thus enters flooded areas to spawn at the onset of the wet season, with eggs and fry dispersed into flooded zones of southern Cambodia and the Mekong delta region. In the upper Mekong, above Khone Falls, the species has been recorded to migrate upstream from Fenruary to May alongside a Henicorhynchus sp. It enters smaller tributaries and streams and again spawns at the start of the rainy season with eggs and fry similarly swept into flooded areas where they complete the initial stages of development. The precise pattern of migrations is therefore slightly different in the upper Mekong since the adults must move into tributaries to access flooded zones, whereas in the lower basin they can do so directly via the main river channel. Eggs were recorded between February and July with a strong peak in May and June while juveniles of around 20 mm TL were observed at various times depending on locality, dispersing into perennial channels when water depth/flow in tributaries and flood plains begins to recede. They have a series of dark, vertical bars on the flanks which fade as they reach maturity. 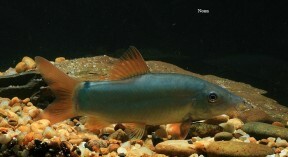 This species is one of the more commonly-encountered botiids in the hobby and is also sold as ‘blue’, ‘orange-finned’, or ‘red-finned’ botia/loach. It’s sometimes subject to artificial colouring with bright blue or purple dyes and we strongly recommend you do not purchase such fish (they’re illegal in several countries). Not only is there a welfare issue to consider but also the fact that the health of the fish is normally compromised during the process leaving them less vigorous and more susceptible to disease. 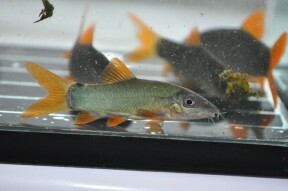 The dyed fish are normally sold as ‘blueberry’ or ‘raspberry’ loach/botia. It’s sometimes confused with Y. lecontei though in reality the two are readily distinguishable from one another by body shape since Y. modesta is a deeper-bodied, more compact fish. Further, in Y. lecontei the overall body colouration is usually brownish with a gold/green sheen and the dark markings present on either side of the caudal peduncle tend to be roundish and not meet on the ventral surface of the fish whereas in Y. modesta base body colour is most often bluish with blue/green sheen and when present (it isn’t always) the dark caudal peduncle markings tend to form a continuous bar around the entire peduncle. 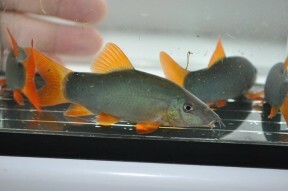 There exist both red and yellow-finned colour variants, with the latter sometimes referred to as Y. sp. ‘blue fin‘ or, incorrectly, Y. lecontei. The former name is derived from the fact that the dorsal fin is the same colour as the body rather than the caudal fin, unlike in the red-finned form where both caudal and dorsal fins are the same colour, which has led to speculation it may represent an undescribed species. Apparently both can be found living alongside one another in nature, but the red-finned form is predominant in the Mekong drainage and yellow-finned the Chao Phraya. At time of writing both are considered to be Y. modesta. 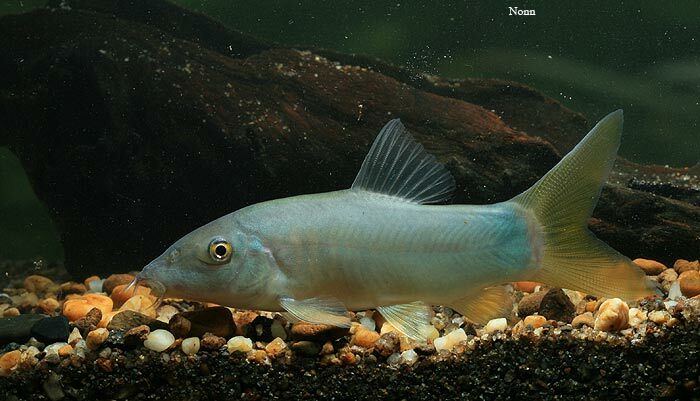 The genus Yasuhikotakia was erected by Nalbant (2002) to include some former members of Botia which were previously referred to as the Botia modesta ‘group’ following Taki (1972). Members are defined by the following combination of characters as given by Kottelat (2004): mental lobe not developed in a barbel, with a pair of fleshy papillae at its anterior edge; fronto-parietal fontanelle large and wide; anterior chamber of gas bladder partly covered by bony capsule; posterior chamber large; top of supraethmoid narrow; optic foramen small; anterior process of premaxilla entire, not surrounding a cavity; rostral process long, with a more or less distinct ridge along inner edge; suborbital spine strongly curved backwards and bifid; head naked. Some behavioural routines exhibited by Yasuhikotakia spp. have been recorded often enough that they’ve been assigned non-scientific terms for ease of reference. Yasuhikotakia spp. also possess sharp, motile, sub-ocular spines which are normally concealed within a pouch of skin but erected when an individual is stressed, e.g., if removed from the water. Care is therefore necessary as these can become entangled in aquarium nets and those of larger specimens can break human skin. Description de deux espèces inédites de Cobitioïdes. The Botia modesta complex (Cobitidae, Botiinae). Sokheng, C., C. K. Chhea, S. Viravong, K. Bouakhamvongsa, U. Suntornratana, N. Yoorong, N. T. Tung, T. Q. Bao, A. F. Poulsen, and J. V. Jørgensen, 1999 - Assessment of Mekong fisheries: AMFP Report 2/99. Vientiane, Lao, P.D.R. Fish migrations and spawning habits in the Mekong mainstream: a survey using local knowledge (basin-wide). 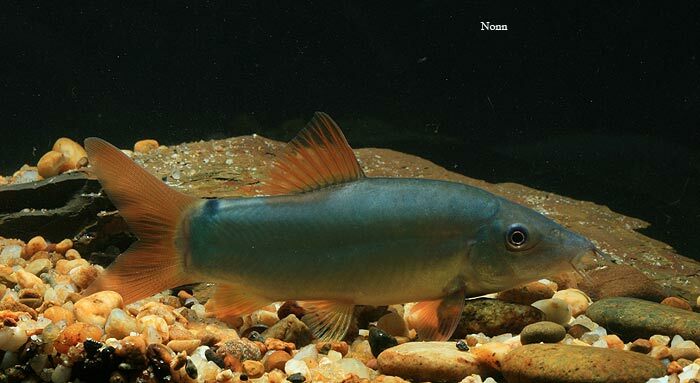 Two new species of the cobitid genus [ì]Botia from the Lao Mekong Basin.